This is probably the all-time favorite snack on Receta. It’s quick to make, requires only five ingredients, and can be adapted to whatever fruit is in season. The recipe is meant to be only a general guideline: “Make it to your taste,” the Trinis say. Recipe courtesy of Ann Vanderhoof, author of The Spice Necklace. 1. Place mangoes in a serving bowl. Add some of each of the remaining ingredients and toss well. 2. Taste and adjust balance of hot/tart/salty/sweet by adding more of the ingredients as you please. Serve with toothpicks to accompany drinks. 3. 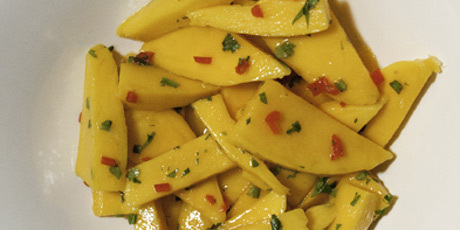 Tip: While an authentic Trini chow uses completely unripe fruit, we like it with just a hint of sweetness and use mangoes that are about half ripe. 4. Tip: Try the same technique with cucumbers, wedges of mandarin orange (the Trinis use a similar fruit called “portugals” in season), pomme cytheres (also called golden apples) or any half-ripe crisp fruit such as pineapple, guavas, or even unripe peaches or tart green apples.